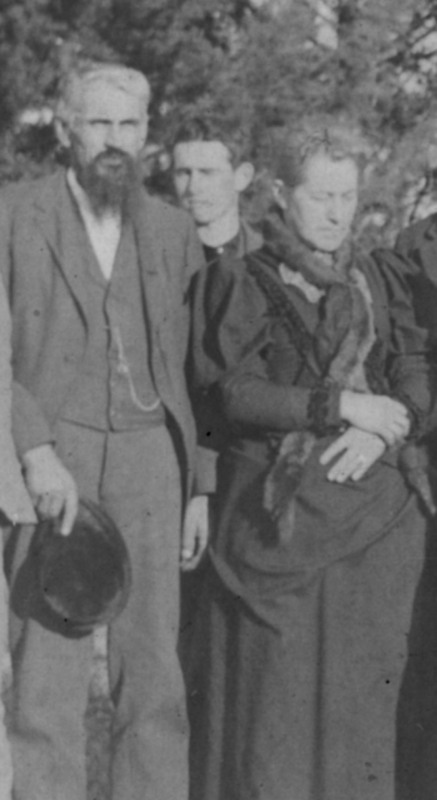 Brothers, Oscar and Hemen Babcock, married sisters, Metta and Retta Bristol in Waushara County Wisconsin. These are their wedding photos. 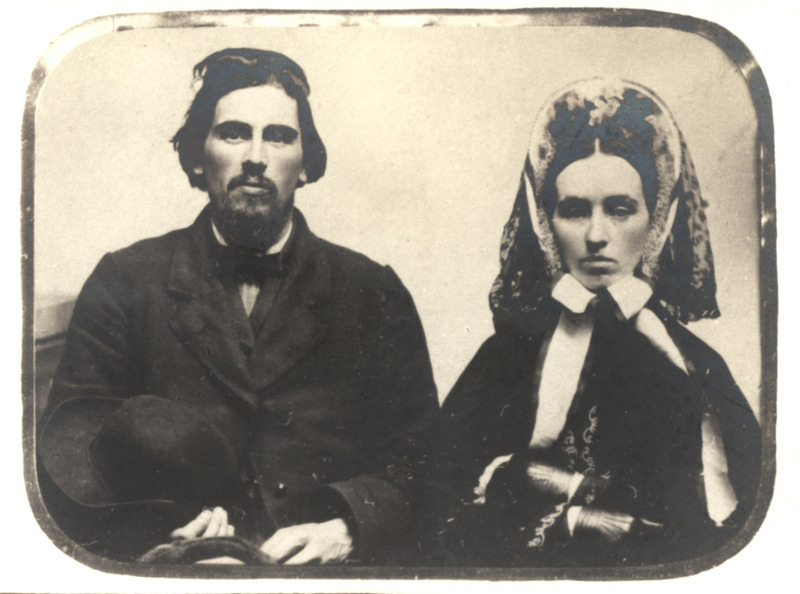 On June 1, 1858, Oscar Babcock married Marietta Amanda “Metta” Bristol in Dakota, Waushara County, Wisconsin. Four children were born to Oscar and Metta in Dakota: Edwin Jeffrey (May 14, 1860), Arthur H., (August 12, 1865), Myra Henrietta (August 6, 1869), and George Ira (March 21, 1871). Oscar was elected to the Wisconsin State Legislature in 1863 and served two terms (1863-1866) during the Civil War years. He was "licensed to preach" by the Seventh Day Baptist church in 1858, but was not officially ordained as a minister until 1872. In 1871 Oscar was instrumental in organizing a group interested in founding a Seventh Day Baptist colony in Nebraska. A scouting party, consisting of four men, headed out from Wisconsin and came upon the beautiful and fertile North Loup River valley. After returning with a favorable report another group headed back in the fall of 1871 to file homestead claims. In the Spring of 1872 about 50 families settled in the North Loup River valley. Also that Spring, Oscar laid out his claim and constructed a dugout in which to house his family, returned to Wisconsin and planned to move his family to Nebraska that fall. The family had planned to make the trip using a team and wagon, but one year old George was seriously ill, and their start was delayed. Then Metta contracted typhoid fever, and within three weeks she had died. By this time George had recovered from his illness, but it was now too late in the fall to make the trip by wagon, so the grieving Oscar, with his four children, traveled by train to Grand Island, and then the last 50 miles by wagon to North Loup, arriving there November, 1872. During the summer of 1873 Oscar replaced the dugout with the first log house in the community. During the first few years the community experienced one disaster after another; a blizzard during April 1873, also during the Spring of 1873 – floods, swarms of grasshoppers destroyed most of the crops, and then on October 12, 1878 a prairie fire. Thankfully, the Babcock family survived and for our benefit Edwin recorded these experiences. In 1878 43 year old Oscar married 19 year old Hattie Payne. Two years later she appears to have died due to complications during the birth of their daughter Hattie Payne Babcock who was born February 8, 1880. Their daughter, died December 24, 1881. In 1889 Oscar married Adeline (Johnson) Preston, a widow who was 49 years old. Oscar was 54. Oscar outlived Adeline, he died October 9, 1914 at age 79, Adeline died July 4, 1912 at age 71. This photo, which has been identified as Oscar Babcock's first wife Meta Bristol, was taken by E. L Eaton in Omaha Nebraska. On close inspection it is clear the woman in this photo is not the same person in Oscar's wedding photo. Also, Metta died in 1872 in Wisconsin, prior to leaving for Nebraska, it would seem very unlikely she would have had her photo taken in Omaha if she lived in Wisconsin. Oscar's third wife Adeline Johnson was 49 when they were married. This is not a 49 year old woman. Hattie Payne was 19 when she married Oscar. This may be her wedding photo. Adeline Johnson, Oscar's Third Wife. In 1889 Oscar Married Adeline Johnson, who was 49 at that time. 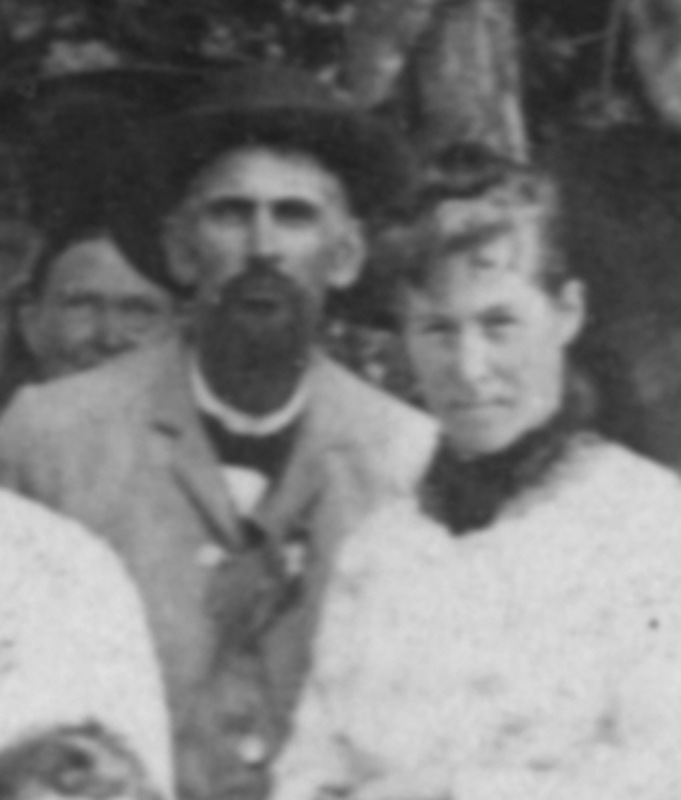 This woman is seen standing next to Oscar in two group photos and may be Adeline. 1. Oscar Babcock-1. He was born on 15 Mar 1835 in Persia, Cattaraugus, New York, USA. Residence 1900 in North Loup Village, Valley, Nebraska. He died on 09 Oct 1914 in North Loup, Valley, Nebraska, USA. Burial in North Loup, Valley, Nebraska, USA. Marietta Amanda "Metta" Bristol. 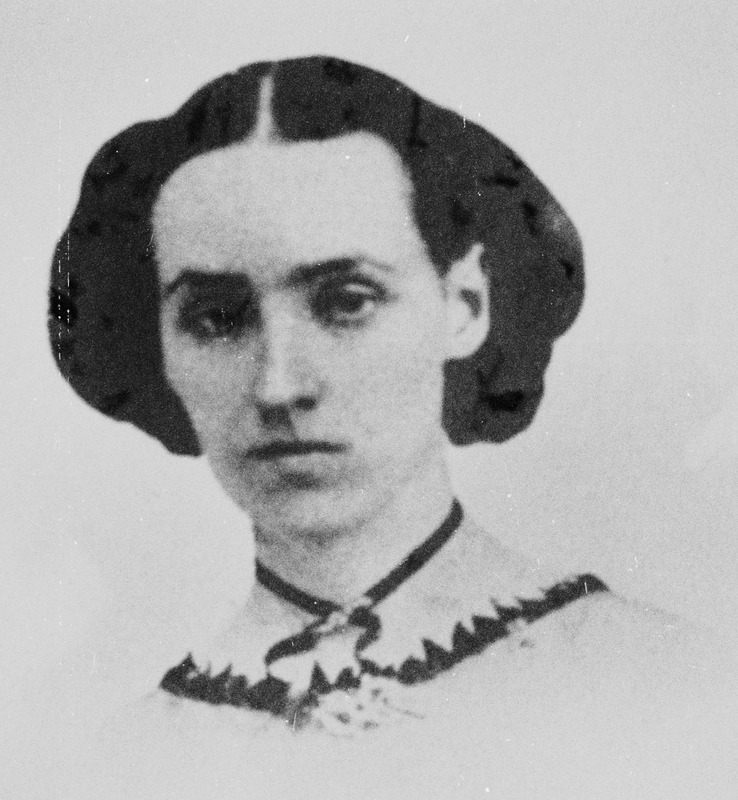 She was born on 24 Mar 1835 in Jamestown, Chautauqua, New York, USA. Residence 1860 in Dakota, Waushara, Wisconsin. She died on 19 Oct 1872 in Dakota, Waushara, Wisconsin, USA. Oscar Babcock and Marietta Amanda Bristol. They were married on 01 Jun 1858 in Dakota, Waushara, Wisconsin, USA. They had 4 children. 2. i. Edwin Jeffrey Babcock. He was born on 14 May 1860 in Dakota, Waushara, Wisconsin, USA. He married Jessie Fremont True. They were married on 01 Jun 1889 in North Loup, Valley, Nebraska, USA. He died on 28 Dec 1925 in North Loup, Valley, Nebraska, USA. 3. ii. Arthur H. Babcock. He was born on 12 Aug 1865 in Dakota, Waushara, Wisconsin, USA. He married Esther Enola Davis. They were married on 05 Jul 1895. He died on 24 Feb 1943 in North Loup, Valley, Nebraska, USA. 4. iii. Ilmiria Henrietta "Myra" Babcock. She was born on 06 Aug 1869 in Dakota, Waushara, Wisconsin, USA. She married William Elroy Gowen. They were married on 21 Jul 1898 in North Loup, Valley, Nebraska, USA. She died on 22 Sep 1947 in Long Beach, Los Angeles, California, USA. Burial in North Loup, Valley, Nebraska, USA. 5. iv. George Ira Babcock. He was born on 21 Mar 1871 in Dakota, Waushara, Wisconsin, USA. He married Cora F Chaffee. They were married on 24 May 1900 in Omaha, Douglas, Nebraska, USA. He died on 10 May 1934 in Fayette, Ohio, USA. Burial in Upper Montclair, Essex, New Jersey, USA (Mt. Hebron Cemetery). Harriet E. "Hattie" Payne is the daughter of Ansel F. Payne and Julia Ann Palmer. She was born 1859 in Indiana, USA. She died Feb 1880. Burial in North Loup, Valley, Nebraska, USA. Oscar Babcock and Harriet E. "Hattie" Payne. They were married 1878. They had 1 child. i. Hattie Payne Babcock. She was born on 08 Feb 1880 in Nebraska, USA. Residence on 04 Jun 1880 in North Loup, Valley, Nebraska, United States. She died on 24 Dec 1881 in Nebraska, USA. Burial in North Loup, Valley, Nebraska, USA. Adeline Johnson is the daughter of Thomas Olin Johnson and Anna Tanner. She was born Sep 1840 in Rhode Island, USA. She died on 04 Jul 1912 in Nebraska, USA. Oscar Babcock and Adeline Johnson. They were married 1889. They had no children. 2. Edwin Jeffrey Babcock-2 (Oscar Babcock-1). He was born on 14 May 1860 in Dakota, Waushara, Wisconsin, USA. He died on 28 Dec 1925 in North Loup, Valley, Nebraska, USA. Jessie Fremont True is the daughter of Melville Beveridge Cox True and Mary Catharine McFarland. She was born on 17 Jul 1865 in Anamosa, Jones, Iowa, USA. She died on 30 May 1966 in Omaha, Douglas, Nebraska, USA. Edwin Jeffrey Babcock and Jessie Fremont True. They were married on 01 Jun 1889 in North Loup, Valley, Nebraska, USA. They had 5 children. i. Katharine Myra Babcock. She was born on 06 Nov 1891 in North Loup, Valley, Nebraska, USA. She died on 17 Sep 1966 in Lincoln, Nebraska, USA. ii. Oscar True Babcock. He was born on 07 Feb 1895 in North Loup, Valley, Nebraska, USA. He married Beulah Vernette Vincent. They were married on 05 Sep 1927 in Milton, Rock, Wisconsin, USA. He died on 13 May 1952 in Omaha, Douglas, Nebraska, USA. Burial on 17 May 1952 in Milton, Rock, Wisconsin, USA. iii. Edwin Jesse Babcock. He was born on 04 Mar 1897 in North Loup, Valley, Nebraska, USA. He married Mary Elizabeth Grace. They were married on 22 Sep 1923 in Sioux City, Clay, Iowa, USA. He died on 28 Jan 1968 in Rockledge, Brevard, Florida, USA. iv. Archie Bristol Babcock. He was born on 31 Oct 1900 in North Loup, Valley, Nebraska, USA. He died on 18 Sep 1928 in Lincoln, Dawson, Nebraska, USA. Burial in North Loup, Valley, Nebraska, USA. v. Arthur Sidney Babcock. He was born on 14 Dec 1903 in North Loup, Valley, Nebraska, USA. He died on 12 Jan 1972. 3. Arthur H. Babcock-2 (Oscar Babcock-1). He was born on 12 Aug 1865 in Dakota, Waushara, Wisconsin, USA. He died on 24 Feb 1943 in North Loup, Valley, Nebraska, USA. Esther Enola Davis is the daughter of Albert Hathaway Davis and Belva Mary Terry. She was born on 17 Feb 1872 in Welton, Clinton, Iowa, USA. She died on 05 Sep 1959 in Sacramento, California, USA. Arthur H. Babcock and Esther Enola Davis. They were married on 05 Jul 1895. They had 5 children. i. Metta Babcock. She was born May 1895 in North Loup, Valley, Nebraska,. Burial 1907 in North Loup, Valley, Nebraska, USA. She died 1907 in North Loup, Valley, Nebraska, USA. ii. Albert Henry Babcock. He was born on 03 Apr 1897 in North Loup, Valley, He married Jessie Beryl Sayre. They were married on 19 Sep 1922 in North Loup, Valley, Nebraska, USA. He died on 05 Jun 1971 in Lakewood, Los Angeles, California, USA. iii. Teddy Babcock. He was born 1901 in North Loup, Valley, Nebraska, USA. He died 1902 in North Loup, Valley, Nebraska, USA. iv. Erlow Ted Babcock. He was born on 11 Oct 1904 in North Loup, Valley, Nebraska, USA. He died on 08 Sep 1975 in Santa Ana, Orange, California, USA. v. Ruth Babcock. She was born on 27 Jul 1906 in North Loup, Valley, Nebraska, USA. She married Richard Glen Sporleder. They were married on 27 Aug 1933 in Albuquerque, Bernalillo, New Mexico, USA. She died on 30 Aug 1987 in Los Angeles, California, USA. 4. Ilmiria Henrietta "Myra" Babcock-2 (Oscar Babcock-1). She was born on 06 Aug 1869 in Dakota, Waushara, Wisconsin, USA. She died on 22 Sep 1947 in Long Beach, Los Angeles, California, USA. Burial in North Loup, Valley, Nebraska, USA. 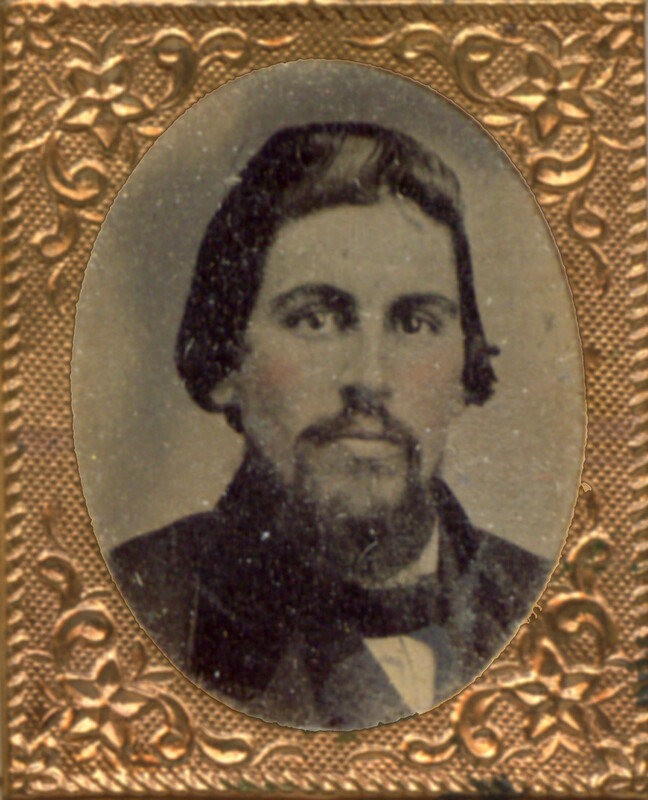 William Elroy Gowen is the son of John Brackett Gowen and Maria Louise Taylor. He was born on 14 Nov 1861 in Steele, Minnesota, USA. He died on 03 Feb 1919 in North Loup, Valley, Nebraska, USA. Burial on 06 Feb 1919 in North Loup, Valley, Nebraska, USA. William Elroy Gowen and Ilmiria Henrietta "Myra" Babcock. They were married on 21 Jul 1898 in North Loup, Valley, Nebraska, USA. They had 2 children. i. George Guy Gowen. He was born on 19 Nov 1899 in North Loup, Valley, Nebraska, USA. He married Adelaide Davis. They were married on 11 Jun 1922 in North Loup, Valley, Nebraska, USA. He died on 29 Jun 1945 in Lincoln, Nebraska, USA. Burial in North Loup, Valley, Nebraska, USA. ii. Nola Gowen. She was born on 01 Sep 1902 in North Loup, Valley, Nebraska, USA. She married Clifford Wayne Vredenburgh. They were married on 30 Jun 1926 in Lincoln, Nebraska, USA. She died on 20 May 1953 in Long Beach, Los Angeles, California, USA. Burial in Cypress, Orange, California, USA. 5. George Ira Babcock-2 (Oscar Babcock-1). He was born on 21 Mar 1871 in Dakota, Waushara, Wisconsin, USA. He died on 10 May 1934 in Fayette, Ohio, USA. Burial in Upper Montclair, Essex, New Jersey, USA (Mt. Hebron Cemetery). Cora F Chaffee is the daughter of Clarence Llewellyn Chaffee and Mary Emmeline Watson. She was born on 11 Mar 1876 in Pittsfield, Warren, Pennsylvania, USA. She died on 20 Feb 1949 in Orlando, Brevard, Florida, USA. Burial in Upper Montclair, Essex, New Jersey, USA (Mt. Hebron Cemetery). 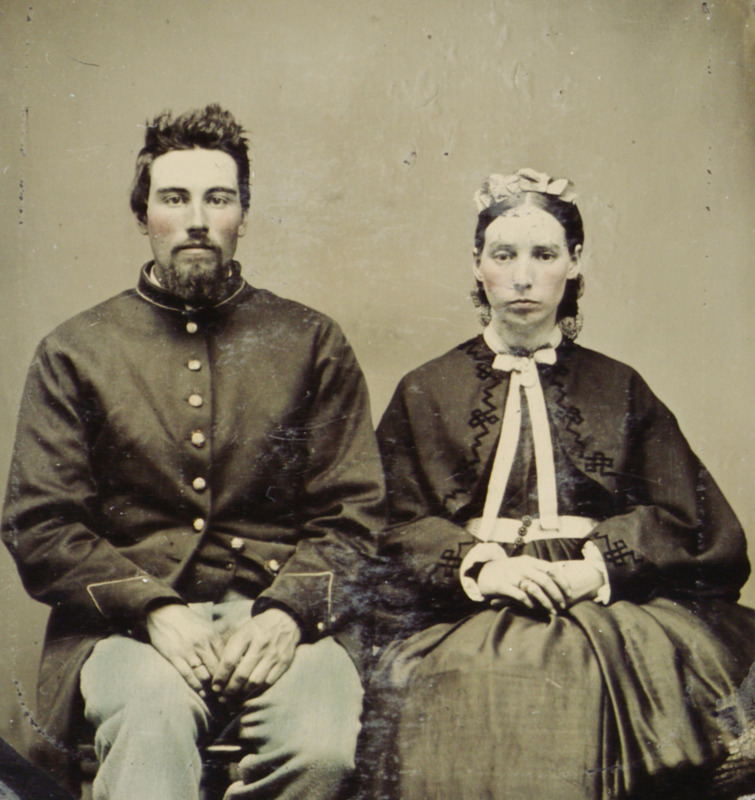 George Ira Babcock and Cora F Chaffee. They were married on 24 May 1900 in Omaha, Douglas, Nebraska, USA. They had 3 children. i. Mary Henrietta Babcock. She was born on 02 Mar 1901 in Omaha, Douglas, Nebraska, USA. She died on 13 Jun 1919 in Montclair, Essex, New Jersey, USA. ii. 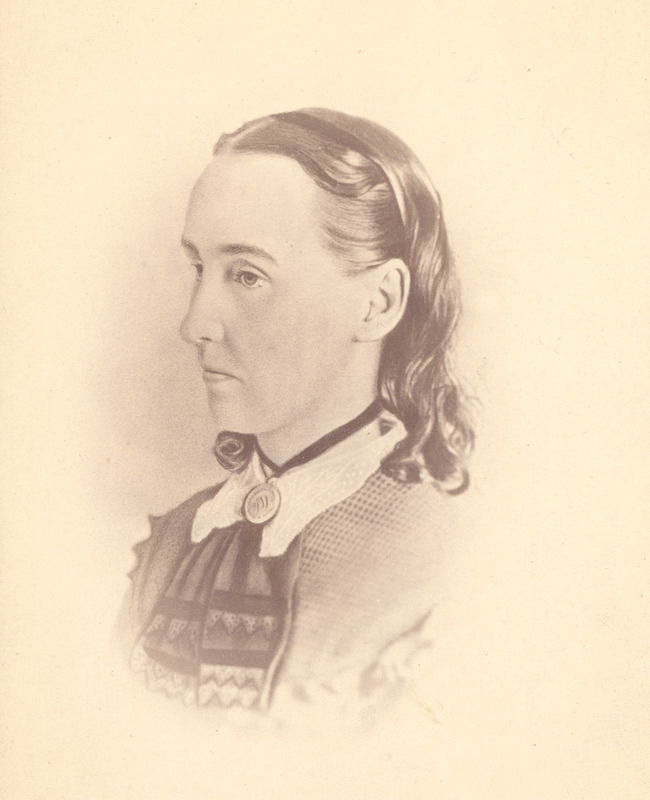 Elizabeth Metta Babcock. She was born on 28 Jun 1904 in Mexico City, Distrito Federal, Mexico. She married John Clarke Barber. They were married on 23 Jun 1928. She died on 07 May 1969 in Coral Gables, Dade, Florida, USA. iii. Richard Chaffee Babcock. He was born on 06 Aug 1908 in Mexico City, Mexico.He married Martha Price Hall. They were married on 11 Apr 1934. He died Jan 1969 in Phoenix, Maricopa, Arizona, USA.